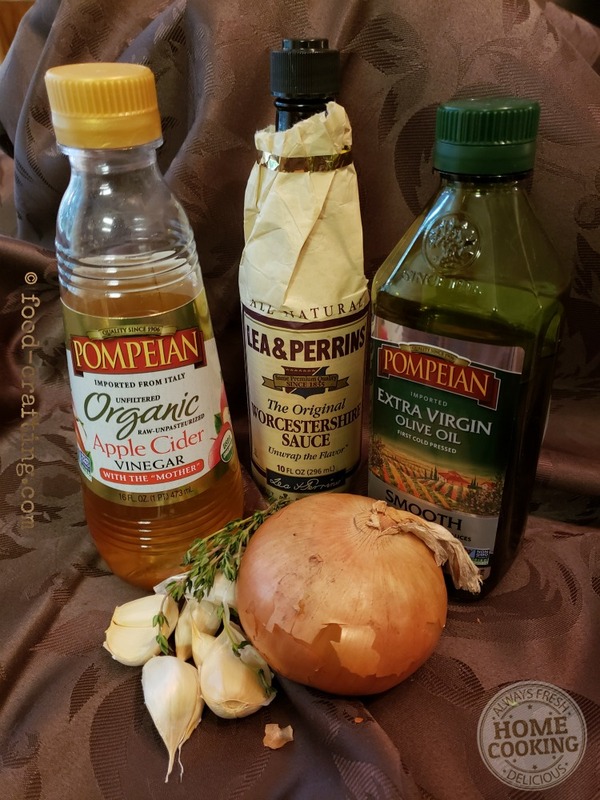 Apple Cider Vinegar Beef Marinade – Today, I’m experimenting with a cider vinegar marinade for a beef roast. The flavor quotient is huge and would also work wonders on thick steaks! My aim is to marinate a tenderloin but I thought an eye of round roast was better suited for the experiment. The eye of round roast was much less expensive than the tenderloin! So, if the marinade works wonders on a less tender roast, I venture to guess that it will be amazing on a tenderloin. 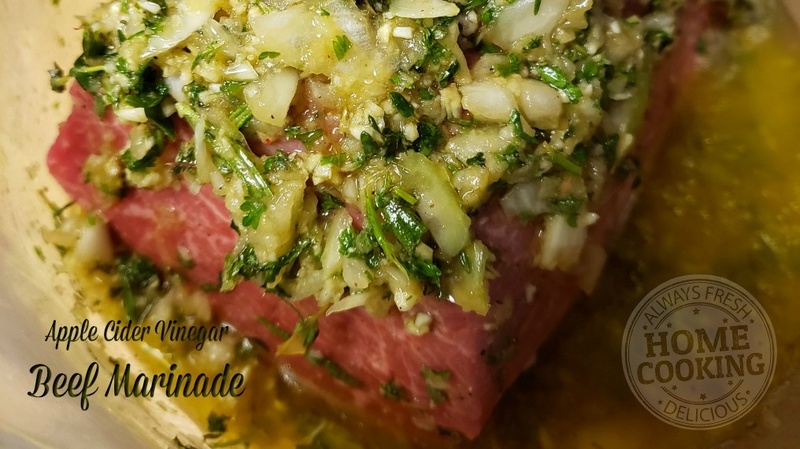 Experimenting With An Apple Cider Vinegar Beef Marinade? Experimenting in the sense that I am playing with the quantities and actual ingredients. Reduce the amount of olive oil or use red wine instead? Do I increase the amount of apple cider vinegar? 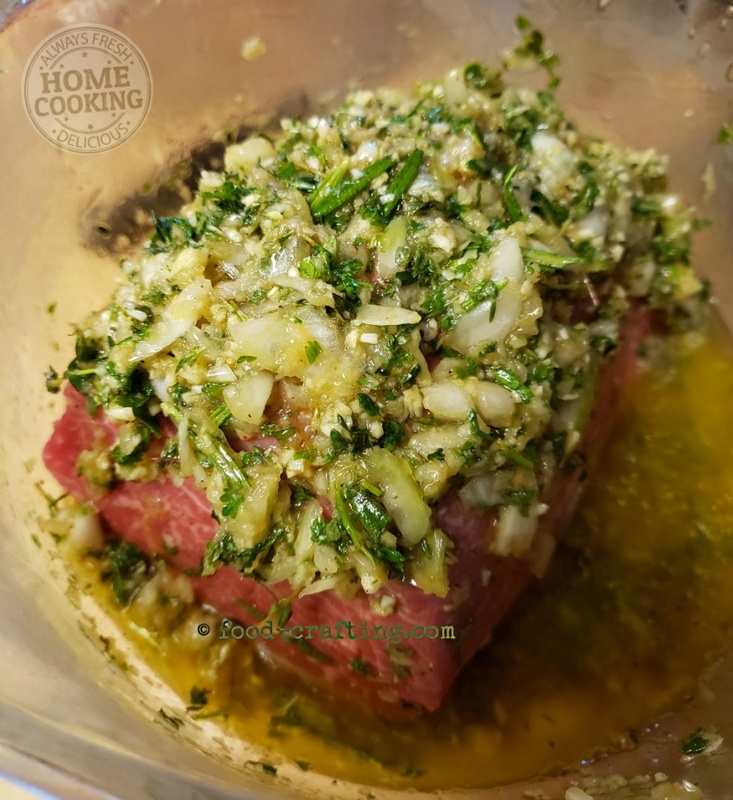 Use more salt in the marinade itself, or select different herbs? Should I marinate for a few hours or overnight in the fridge? 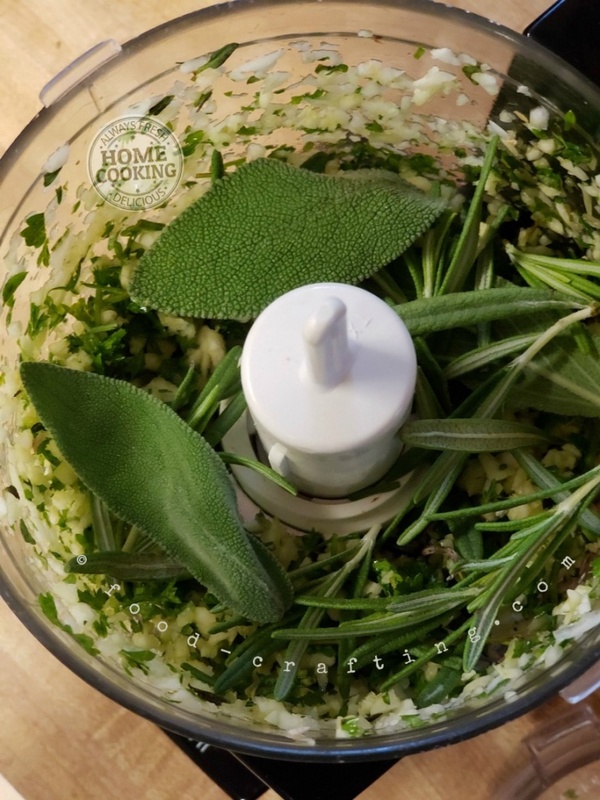 You will need a mini-prep food processor to prepare some of the marinade ingredients such as the fresh herbs and garlic. In a large glass bowl, mix the following ingredients. processor along with the parsley and other herbs. Place the roast in the bowl and roll it in the marinade to cover all sides. 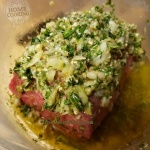 Cover the meat with as much of the marinade herb/onion mixture as possible. 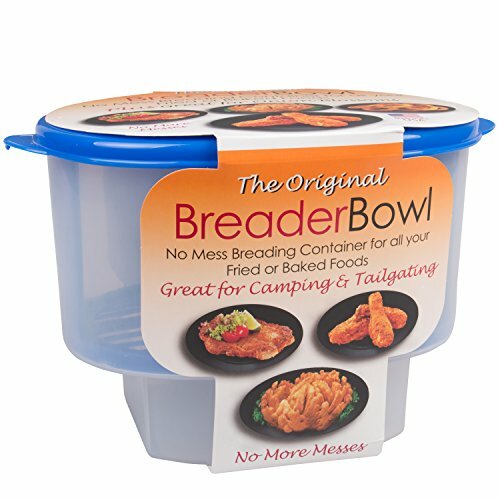 Seal the bowl with plastic wrap. Refrigerate and marinate for at least 4 hours turning the roast over to marinate all sides evenly. The oven must be at 500* before putting the roast in the oven. Place the roast in a metal pan. Do not cover with foil. Roast at 500* for 15 minutes. Lower the oven temperature to 375* and continue to cook an additional 5 to 6 minutes PER POUND or an additional 12 to 15 minutes. Allow the roast to rest for about 10 minutes before slicing. Verdict? The eye of round was very tasty but a tenderloin would be much more tender. The tenderizing properties of apple cider vinegar did have much effect on eye of round. 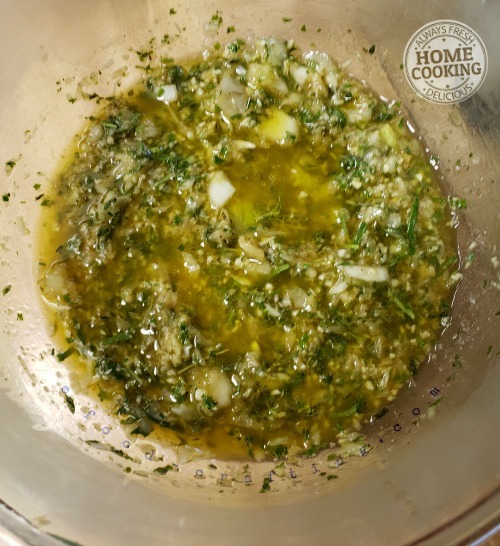 Next marinade will have only 1/4 cup of oil, in other words, I would opt to reduce the amount of oil in the marinade rather than the vinegar. I might also reduce the amount of Worcestershire sauce and use more anchovy paste. Be careful when adjusting seasonings. The Worcestershire sauce is salty and so is the anchovy paste. If you want to adjust flavors, consider adding onion processed to a pulp. Personally, I would prefer this marinade on thick rib eye steaks which could be seared to medium rare perfection almost instantly. The roast was sliced thin and served with sautéed potatoes and green beans. Everyone loved the robust flavor of the herb crust. 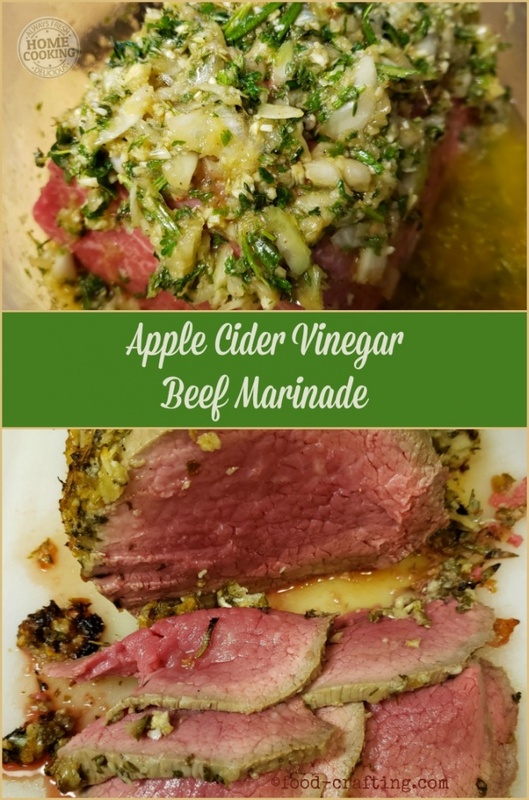 1 Experimenting With An Apple Cider Vinegar Beef Marinade? Previous Post Recipe Homemade Vegetable Beef Soup: Easy Stove Top Meal Next Post Braised Country Style Pork Ribs: Super Easy Recipe For Tonight’s Dinner!